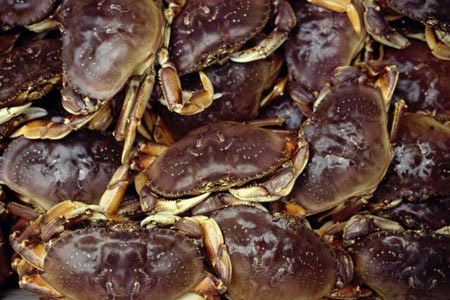 The commercial harvest for Dungeness crab in Southeast Alaska this summer was the lowest in several decades. But it might not be a complete bust. The harvest numbers only tell part of the story. The summer season for Dungies closed three weeks early in Southeast. The thing is Dungeness crab in Southeast are tricky because state managers don’t know a lot about them. The crab are on a four-to-five-year life cycle and the commercial fishery is expected to fluctuate accordingly. But there are no stock assessment surveys, so biologists rely on commercial harvests to track the population. Most years the population seems healthy enough to hold a two-month fishery. But this summer season closed early because the harvests weren’t meeting the threshold set in state regulations. The season brought in 1.3 million pounds, which is the lowest harvest in over 30 years. The historical summer average is 2.7 million. Since the season was cut weeks short it’s not surprising the overall harvest was low. The situation is kind of a catch-22. Managers like Kellie Wood, a Crab Biologist with the Alaska Department of Fish and Game, have to close the fishery because of low numbers. But now, they won’t get a picture of what a full harvest would have looked like. “Not on the bite” refers to the crab’s molting when they lose their shell and are not hungry. Dungeness crab fishing is all about luring crab into baited pots when they are hungry. And crab without a hard shell or “soft crab” have no value anyway. Wood said there has been some anecdotal evidence from fishermen reporting light-colored crab near the end of the fishery. That would indicate crab that recently molted. So this summer’s low harvest could be due to a late molt. It could mean that the crab are there, it’s just bad timing. The crab stay buried for about four to six weeks. Biologists believe that Dungeness crab molt one or two times a year but they don’t really know. Exactly how Dungeness crab function in regional waters is pretty speculative. “There’s a lack of life history data in Southeast Alaska,” Wood said. And they don’t know why the crab might have been molting late. Temperatures were a little colder this year than in recent years. It’s only the second time in over 15 years that the summer season closed early. In 2013, managers closed the season a week early when there was a high percentage of soft-shelled crab. Managers are still evaluating how much of this summer’s harvest could have been soft-shelled. If there’s a lot, like in 2013, then this fall’s fishery could be normal or better than normal. Managers would, by regulation, open up the fall season for at least a 30-day fishery. This summer the crab was harvested by 184 permits. Crab were purchased at an average price of $3.09 per pound. The value of the summer season catch was $4 million, close to $2 million less than last summer. District 8, which includes waters around Petersburg and Wrangell, saw the largest harvest of 394,000 pounds.